The second prototype of the LCA Navy Mk.1, currently in ground and taxi tests, is ready for its first flight and could take to the air just after Diwali, top sources tell SP's. 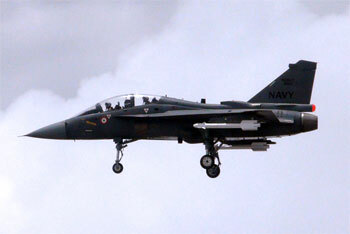 The first single-seat prototype of the naval jet incorporates the improved landing gear that was created under a consultancy with Airbus Defence & Space (Earlier EADS/Cassidian) and weight reduction, a process which will carry forward on the NP5 (the second trainer prototype), which, as SP's reported in August this year, is being planned as a risk mitigation exercise. The first trainer prototype went supersonic in March this year with improvements, after being out of action and virtually on the drawing board for nearly two years after its first flight in 2012. In December this year, the NP1 prototype that's currently in a regular routine of test flights will also make its first flight off the shore-based test facility in Goa. The NP1 has completed over 25 flights so far, notching up 21 sorties since it began flying again in November last year, with ten of those flights taking place since January this year. The sortie generation rate on the NP1 is less than the desired rate, though a concerted call has been taken at ADA to take all precautions to study the new landing gear, sink rate performance etc.